The Surfcaster's snottier younger brother may not appeal to everyone… but it does sound great. Overly fancy binding; clumsy masking boundary. The Skatecaster's finish is slightly marred by a clumsy neck join. Since Fender's acquisition of the Charvel brand in 2002, the parent company has remained pretty true to the original tearaway teen's mantra of producing hot-rodded rock guitars. After the Art Series and its association with Edward Van Halen (surely the most famous of the original Charvel users from the late '70s) piqued interest, along came the truly awesome San Dimas range, which stayed even closer to the original West Coast vibe. "The Skatecaster's sheer mass of mahogany helps round off any inherent abrasion from its EMG humbuckers, and we'd suggest it gives a great Kirk Hammett-style scorching lead tone." Today, with a San Dimas Style 1 costing a mere £619 and selling very nicely, we'd assumed that Charvel would consider continuing along these 'heritage' lines. However, in the spirit of evolution comes the new Desolation range, which includes a number of versions, also at various price points, of three designs that Charvel has not previously utilised - the Skatecaster SK-1, DS-1 and DC-1, all available in Floyd Rose or hardtail models . That said, the inspiration behind the SK-1 is one that Charvel has used before. The Surfcaster, one of the first new 'retro' guitars when released in 1991, boasted two Danelectro-style lipstick pickups along with a Rickenbacker-esque cat's-eye soundhole - quite a serious style change for Charvel. Each of the new designs has the option of either a Floyd Rose locking vibrato or hardtail bridge. Either way, they're mated to a through-body neck made from a three-piece mahogany laminate. The SK-1 sports a rosewood fingerboard adorned with 24 jumbo frets and abalone 'keystone' inlays, and has been left unfinished save for a lick of gunstock oil. It's beautifully smooth and Charvel's name for its slim profile - Fast Neck - says it all, with the 305-406mm (12-16-inch) compound fingerboard radius adding to the sleek feel. Unfortunately, the neck is let down by a clumsy masking boundary between the natural neck mahogany and the thick body finish. It's far too proud and is certainly noticeable to the touch. Considering the price, it should be neater. The body and headstock are bound in abalone, which we can't help feeling is gilding the lily somewhat, and our example features a body composed of mahogany wings topped with a flame maple veneer finished in trans black. Should you prefer the flat black options, the body is relieved of its sliver of maple. Electrics comprise an 81/85 EMG set of active pickups controlled by a single volume pot and a standard three-way toggle selector. The double-locking Floyd Rose vibrato is the FRT-O2000, an OEM-version of the German-made Floyd Rose Original, manufactured in the Far East. Through-neck designs are celebrated for their long sustain, and that's certainly evident here. 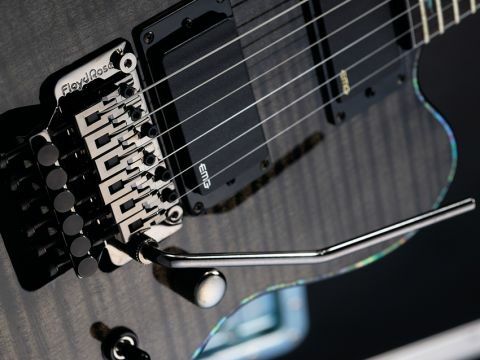 Owing to its less-than-totally intimate connection with the body wood, however, a Floyd Rose will take some tone away. This doesn't stop the SK-1 from sounding monstrous. The Skatecaster's sheer mass of mahogany helps round off any inherent abrasion from its EMG humbuckers, and we'd suggest it gives a great Kirk Hammett-style scorching lead tone. It's full of gain when required, but demonstrates that there can be adequate tonal wiggle room within the realm of the active pickup. The neck unit is based around an Alnico V rather than a ceramic bar magnet, and to our ears they sound smoother and bit more subtle. Played clean, there's some lovely woody body to strummed chords and, as the amp gain is raised, so is the trebly edge. The SK-1 stays in tune, plays extremely well and offers satisfying heavy rock and metal tones. The Desolation series is far removed from the hot-rodded custom S-types for which Charvel is loved historically, but we concede that most metal teenagers won't care too much about that. Try one.